Arizona author Betty Webb is always a favorite to welcome back for Authors @ The Teague. Although she was here to publicize her latest Zoo mystery, The Koala of Death, she also discussed her other books. Betty said she is probably best known for her Lena Jones mysteries, series books set in Arizona. But, one of them, Desert Run, even has a section set in Glendale. She thinks she put her favorite German restaurant, Haus Murphy's, in that book. Her books, Desert Wives and Desert Lost, deal with polygamy. Those books were instrumental in getting laws against polygamy put in place in Arizona. Then, Webb packed up to tell us about her background. She was a reporter for twenty years for The Tribune. She was hired as a music critic, for no good reason. Maybe it was because she could tell the difference between Bach and Mozart, and Metallica and other bands. After a while, she realized there was no book reviewer, and asked if she could review books. She was told no, because they already used the syndicated reviews from the New York Times. But, Betty covered all the bands and symphonies that came to Arizona. So, she said, why can't we treat authors in the same way? If an author is coming to Arizona, let me interview them. After a while, those articles started to be picked up by the New York Times. Webb said she was nosy, born nosy. She always asked unacceptable questions. When she noticed the oddities about Arizona living, she started doing articles about odd things. From there, she started covering everything from domestic abuse to polygamy to child abuse. She made her career up as she went along. Betty Webb's Lena Jones mysteries are based on real crimes and problems in Arizona. Desert Noir, the first book, came from the abuse of eminent domain. When they wanted to build the stadiums in downtown Phoenix, they used eminent domain to take a neighborhood of old adobes. Webb said most people sold for $25,000, but there was a grandmother who held out, saying she was born in that house, the one her own grandfather built. She'd never known another house. The publicity favored her, and finally she was given a much larger amount, enough to buy a decent house. She sold, reluctantly, the same year she died. A subplot of Desert Noir is eminent domain. The second book, Desert Wives, dealt with polygamy. Webb wanted to cover it for the newspaper, but was told it wasn't about their service area. So, she went to Colorado City on her own, the largest polygamy compound in Arizona. She found a slum there, because as long as a home is not finished, the owner doesn't have to pay taxes. Then there was the major financial reason for polygamy in Arizona. Since a man can have only one legal wife, all of the sister wives, the concubines, are not legal. So, their children are illegitimate, and eligible for welfare. Many of the sister wives are "married" at thirteen, and have twenty or more kids. There are welfare checks for each of those children. Then, many of those children are disabled because intermarriage has been common for one hundred years. According to Webb, 65% of the children are born with genetic defects. Those children receive SSDI and SSI for their entire lives. Warren Jeffs, the prophet in Colorado City, was getting all of those checks, since the members were required to turn them over to him. It made him a multimillionaire. Although Desert Wives was a novel, Webb put her research in the back of the book. When the book came out, there was a national explosion. And, Arizona was forced to address the issue. Janet Napolitano was the Attorney General at the time. Desert Shadows came about because, as the newspaper's book reviewer, Webb received all kinds of books. Self-publishing was starting to boom, and Webb was receiving some whacked-job books. Two books she received at the same time sent her over the edge. She received two racist books in one day. One claimed the people in the Japanese internment camps were happy. Webb said anyone who publishes with a reputable publisher would have to prove their argument, but with self-publishing, people can publish anything they want. Desert Shadows deals with self-publishing. The old German prisoner of war camp in Phoenix in World War II is the subject in Desert Run. Sailors taken prisoner in the North Atlantic were sent to this camp, because the best place to imprison sailors was considered to be the desert. Thirty-two hundred German POWs were there, but the security was quite lax. There are stories of German prisoners who crawled under fences to meet girlfriends, and came back to camp. They were well-fed, had a softball field. Many of them did not want to return to Germany after the war, and some came back. Several live in Glendale, and every few years there is a reunion with the guards and the ex-prisoners. But, officers were supposed to attempt to escape. So, they came up with a plan, and twenty-five people went along with it. They'd dig a tunnel out, one 176 feet long. They had a map with squiggly blue lines, and blue lines indicated rivers. They built a collapsible boat, thinking they'd sail it down the Salt River Canal, and end up sailing to Mexico. On December 24, Christmas Even, they took the boat through the tunnel, just to find a dry canal. So, they carried the boat to the Salt River, only to find it was all sand. Then, they dropped the boat, and decided to spread out through the desert. They had no food or water with them. They were living on roadkill. Soon, they started to surrender. They even surrendered to housewives and kids. The Arizona Republic published their pictures, saying there was a $25 reward. That was a good amount in 1944, so some of the Pima Indians went back to tracking, and went out in the desert, and brought them back. They were all caught. Desert Run is told from two points of view, that of Lena in present day, and, in 1944-45, that of a sailor who escaped. Desert Lost is Webb's other polygamy book, a story of the lost boys. In polygamy, if one man has many wives, some men won't have any. Some boys don't survive, but others, at the age of thirteen or fourteen, are loaded into vans, and dumped in cities such as Phoenix, Flagstaff or Salt Lake City. They lead terrible lives. The Lena Jones books are hard to write, with heavy subjects, and a great deal of research. So, Webb wanted to cheer herself up, and write something funny. As a volunteer at the Phoenix Zoo, she works in Monkey Village, where zoo guests are allowed in the enclosures where monkeys run free. There are no barriers. It's a personnel-heavy exhibit. They have to make sure no one picks up a monkey, or gets bitten. By this time, Webb had retired from The Tribune, and her volunteer duties at the zoo got her out of the house. One day, on her lunch hour, she took the back path, and saw the anteater. The anteater, Jezebel, had a baby. An anteater baby crawls up on its mother's back. It looks just like mom. Anteaters also have a three-foot long blue tongue. So, Jezebel and her baby were chasing each other, and then they were laying down boxing with each other. Webb thought it was so cute, and she should write an article about the anteater. Then, she decided to try it out as a book. The Anteater of Death was fun to write, but Betty never thought she'd get it published. She sent it to her editor, Barbara Peters at Poisoned Pen Press. It usually takes Barbara a couple months to respond because she's so busy. Poisoned Pen Press is now the second largest mystery publisher in the U.S. But, by the end of the week, Barbara contacted her, and said we want to do it. And, it is going to be a series, isn't it? And, Betty assured her she has several more planned. Then, they had to decide if the books were going to be published under Betty Webb or a pen name. Sometimes there is a reason to use a pen name. If an author is publishing in a different field or genre, a pen name separates you from your other books. Webb had a good reputation with her Lena Jones books. If The Anteater of Death bombed, Webb would have egg on her face. Fortunately, the book was very popular, and had good reviews. Webb said she kills herself to write the Lena Jones books, but the Zoo mysteries are easy, breezy. But, Betty had to choose another animal. So, she went to the zoo bookstore, where, as a volunteer, she gets a hefty discount, and bought an $80 book, Encyclopedia of Animals. And, she saw a koala, and knew she'd have to research it. The Phoenix Zoo didn't have any koalas, although there are now some coming in October. The Koala of Death includes some of the other animals in the zoo. One activity in the book is one Webb's participated in, Bowling for Rhinos. It's a fundraiser for rhinos, because it's scary for them. They're killed for their horns, considered an aphrodisiac by some men. The horns are also used as hilts for swords and daggers. Betty has participated in Bowling for Rhinos for two years, and it's a fun fundraiser. She incorporated it in the book. The Great Flamingo Round-Up is another activity that was included. How do you give flamingos avian flu shots? A band of zookeepers use large plastic walls, and move the herd down the enclosure to a V, where vets are waiting to give them shots. It's not easy to sweep them into that V. And, the zookeepers have to grab them around the body, while the flamingo is trying to get them with their beak. That's included in The Koala of Death. A major part of the book involves a killing near the koala. Animals are a part of the mystery, indirectly. Webb thought of these books are funny, written for the sheer pleasure. The Lena Jones books involve social service, but Betty didn't think of the Zoo mysteries that way. But, many people have told her they've learned so much about zoos and animals, and they're volunteering at the zoo. Webb is working on the seventh Lena Jones book, in a series projected to go to ten. All she would tell us is that it deals with a serious problem in Arizona and elsewhere, but Arizona is ground zero for the problem. That book will be Desert Wind. The Zoo mysteries feature Teddy Bentley, a zookeeper at the Gunn Zoo in California. The town is based on Moss Landing, a town ninety miles south of San Francisco. Moss Landing has a population of 500, and they all live on boats. There are only two streets. One has antique stores, and the other has warehouses. There is a big natural harbor that's protected. Everyone has to live on a boat. Teddy has to live on a houseboat. This has enabled Webb to take tax-deductible trips to Moss Landing every summer. Webb said this is the life of a writer. Life happens, and if you're alert and paying attention, you'll have wacky opportunities. If Betty hadn't taken a lunch break at the Phoenix Zoo, she wouldn't have written The Anteater of Death. Webb started and ended The Anteater of Death from the anteater's point of view. But, koalas sleep 75% of the day, so she didn't write The Koala of Death from the koala's point of view. Critics liked the second book, but someone said they liked Anteater better because they liked the anteater's point of view. So, never try to write for anyone else. Betty said she has planned the next Zoo mystery, but she won't tell. She got the idea when she saw something, and was so tickled it made her laugh. She knew it would be her next book when she saw the person and animal so disgusted with each other. The next Lena Jones mystery will probably be out in December 2011, because the research is extensive. As always, it was a pleasure to host Betty Webb for Authors @ The Teague. 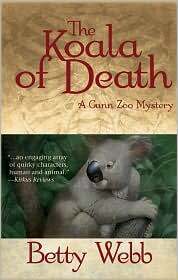 The Koala of Death by Betty Webb. Poisoned Pen Press, ©2010. ISBN 9781590587560 (hardcover), 250p. Very nice write up, Lesa! I love Betty's Lena Jones mysteries. They are dark, but very, very compelling. Betty did a call-in with my mystery group a while back when we were reading DESERT WIVES. I haven't read the zoo books yet, but I will. Thanks for sharing! Like Kay, I have not yet tried the zoo books just yet, but certainly intend to. And after reading this, sooner rather than later. p.s. - I think I covet Betty's necklace. I read both series that Betty writes. As you said, the Lena Jones books are compelling. But, I love the characters and the animals in the Zoo mysteries. I enjoy the humor in those books. Even with the humor, though, Webb never takes the murders lightly. I think you'd enjoy the Zoo mysteries, Kaye. And, in response to a comment, Betty said Chico's for the necklace. Betty graciously came to talk to our book group when we read Desert Lost and we really enjoyed her. I'm guessing her next zoo mystery will feature the spider monkeys and a hat! Oh, that's a fun guess, Cindy, as to her next zoo mystery! And, spider monkeys could certainly be indirectly involved in a murder. I can't wait to read these books. Thanks for this interesting article. -- BrendaW. PS - yes, I have surfaced! Hope to be a lot more regular now. You're welcome, Brenda. I hope you enjoy the books. Good to see you back. I know it hasn't been easy. The first six months seem to be a catch-up on everything. Take care. And, wasn't that a good reason the koala didn't narrate?